A dog’s life is short compared to our own so it’s important to not waste valuable time with your best friend. The earlier you begin training your dog, the better the outcome. A well-behaved dog can go places with you that a poorly-behaved dog can’t. A well-behaved dog is easier to live with and a lot more fun to share your life with. I can help you achieve your obedience and behavior goals. I work as fast as each dog and owner team are prepared and able to go — most training is accomplished with enormous satisfaction in as few as four training sessions. I know your time is valuable I want to get you where you want to go as quickly as possible. 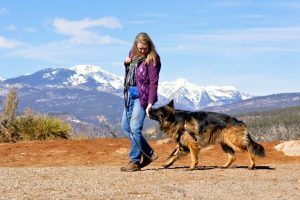 There is never a reason or excuse good enough to use force, fear or pain while teaching an animal and my commitment to you and your dog is that your dog can learn without resorting to using those out-dated and harmful methods. Let’s work together to communicate what you need from your dog with fun, fair and effective training.